One of the nearest supermassive black holes to Earth with active powerful outbursts has been discovered. Such outbursts are part of the "feedback" process that is important to the evolution of the black hole and its host galaxy. Evidence for these eruptions was found with the Chandra X-ray Observatory in the galaxy NGC 5195. 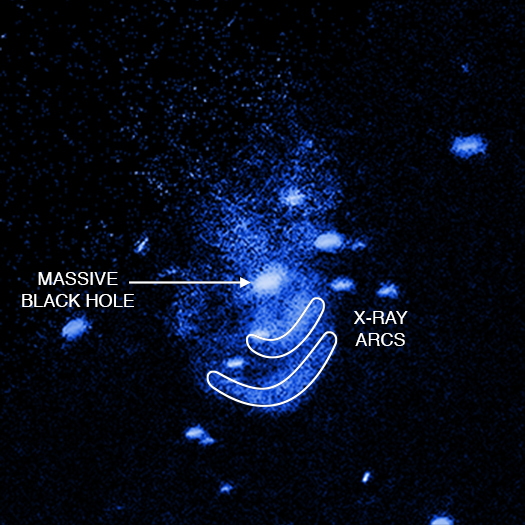 Two arcs in the X-ray data suggest separate eruptions from the black hole occurred millions of years ago. Astronomers have used NASA's Chandra X-ray Observatory to discover one of the nearest supermassive black holes to Earth that is currently undergoing powerful outbursts, as described in our latest press release. This galactic burping was found in the Messier 51 galaxy, which is located about 26 million light years from Earth and, contains a large spiral galaxy NGC 5194 (also known by its nickname of the "Whirlpool"), merging with a smaller companion galaxy NGC 5195. This main panel of this graphic shows M51 in visible light data from the Hubble Space Telescope (red, green, and blue). 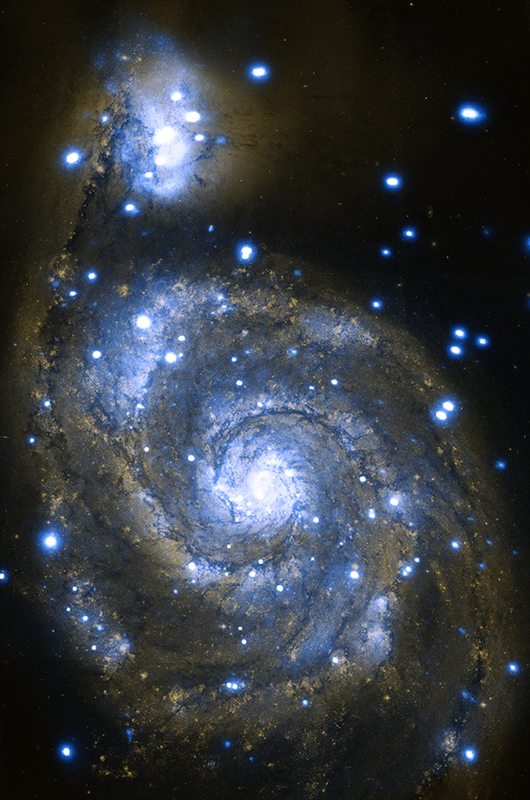 The box at the top of the image outlines the field of view by Chandra in the latest study, which focuses on the smaller component of M51, NGC 5195. The inset to the right shows the details of the Chandra data (blue) of this region. Researchers found a pair of arcs in X-ray emission close to the center of the galaxy, which they interpret as two outbursts from the galaxy's supermassive black hole (mouse over annotated image for additional information). The authors estimate that it took about one to three million years for the inner arc to reach its current position, and three to six million years for the outer arc. Just outside the outer X-ray arc is a slender region of hydrogen emission detected in an optical image. 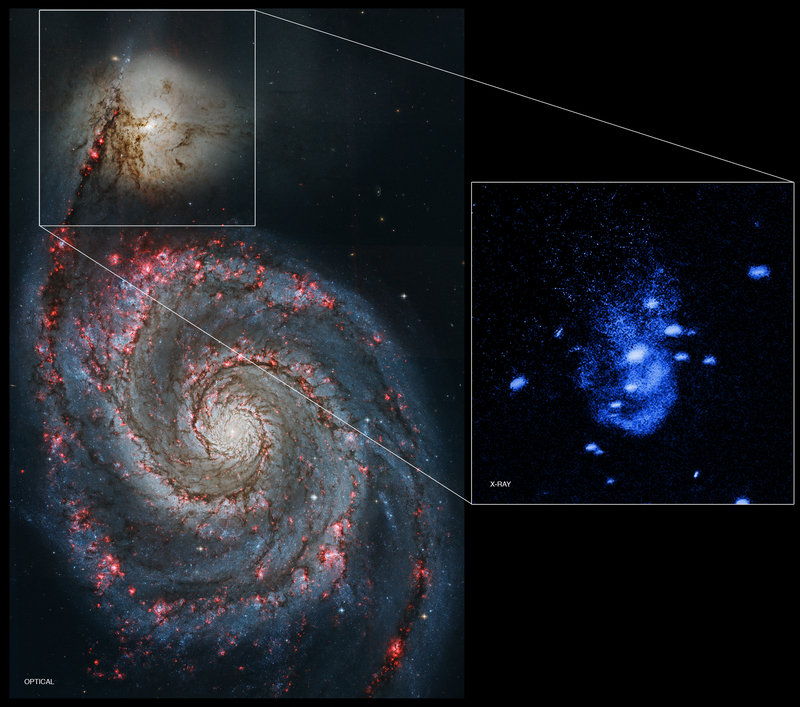 This suggests that the X-ray emitting gas has "snow-plowed" or swept-up the hydrogen gas from the center of the galaxy. This is a clear case where a supermassive black hole is affecting its host galaxy, in a phenomenon that astronomers called "feedback." This arc of hydrogen gas contains what appears to be two or three small "HII regions." An HII (pronounced "H-two") region is created when the radiation from hot, young stars strips away the electrons from neutral hydrogen atoms (HI) to form clouds of ionized hydrogen (HII). This suggests that the outer arc has plowed up enough material to trigger the formation of new stars. 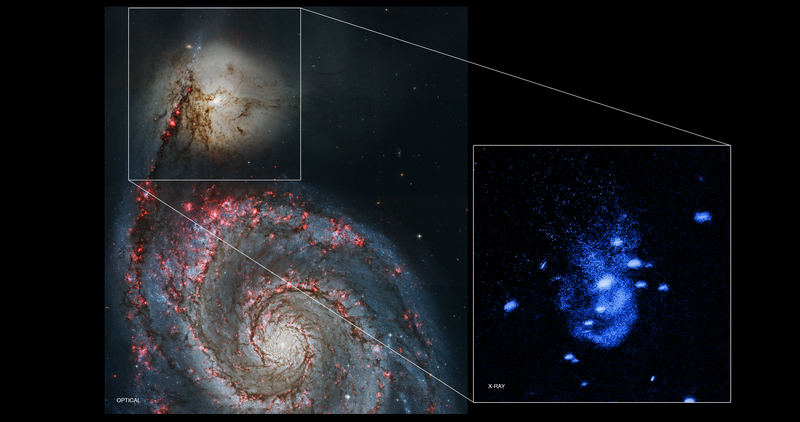 The outbursts of the supermassive black hole in NGC 5195 may have been triggered by the interaction of this galaxy with the large spiral galaxy in M51, causing gas to be disrupted and then funneled down towards the black hole. These results were presented at the 227th meeting of the American Astronomical Society meeting in Kissimmee, Florida. They are also in a paper submitted to The Astrophysical Journal and the authors are Eric Schlegel (University of Texas at San Antonio), Christine Jones (Harvard-Smithsonian Center for Astrophysics), Marie Marachek (CfA), and Laura Vega (Fisk University and Vanderbilt University Bridge Program). Coordinates (J2000) RA 13h 29m 59.9s | Dec +47° 15' 58.00"
The spectrum at witch we observe our own universe is changing. I hope we can learn more about what is natural recurring and make wise use of the knowledge obtained from these wonderful spacecraft. A small galaxy merging with a larger spiral galaxy about 26 million light years from Earth. About 26 million light years from Earth. X-rays from the Chandra X-ray Observatory plus a visible light image. 45,000 x 76,000 light years. X-rays are blue, optical are red, green and blue. In the constellation Canes Venatici.